This sea day was fairly quiet as folks began packing and preparing for the journey home. Some folks are sad, while others are ready to be home already. A few guests are staying on the ship for the Christmas cruise to Hawaii and then through the Panama Canal to Ft. Lauderdale where the ship will begin the World Cruise. Ian the EXC tour guide gave a look back at our voyage with photos of our entire journey. Kent attended a lecture with Dr. Joe Kess who talked about Edward Curtis who took early photos of Native Americans. Meanwhile, Mark attended another cooking class in America’s Test Kitchen where Spencer showed folks how to make a Mediterranean dinner. The recipes for this day were lamb meat balls with a yoghurt sauce, a couscous with radicchio and a smooth creamy hummus from scratch. For lunch we dined with Spencer from the test kitchen, Brian from Virginia, Alan from Tasmania and Steve from New York. In the afternoon the Philippine crew members put on a show featuring songs and folk dances from their country. One crew member was dressed in a tuxedo on one side and a frilly red dress on the other. He wore a long-haired wig on the side with the dress and a short man’s haircut on other side. As he turned from one side to the other his voice would change from a low voice to a high-pitched voice. The entire show was a lot of fun and was very well received by the passengers. For dinner we dined with Jeffrey and Madeline from Virginia and Zane, one of the crew members who works with the children onboard. The evening’s entertainment was a new show by the Alley Cats. They are the acapella group that perform songs from the 50’s and 60’s. They sang a variety of holiday songs as well as the 50’s and 60’s that they are known for. Not as much sparkle as the previous show. The seas were fairly calm and the skies changing between sunshine and scattered clouds. There were continuing swells in the sea creating a constant rolling motion on the ship. This was a vast improvement from the jerking movements onboard prior to our arrival in Hawaii. On this sea day we attended a Mariner Luncheon where they once again filled us with wine and delicious food. 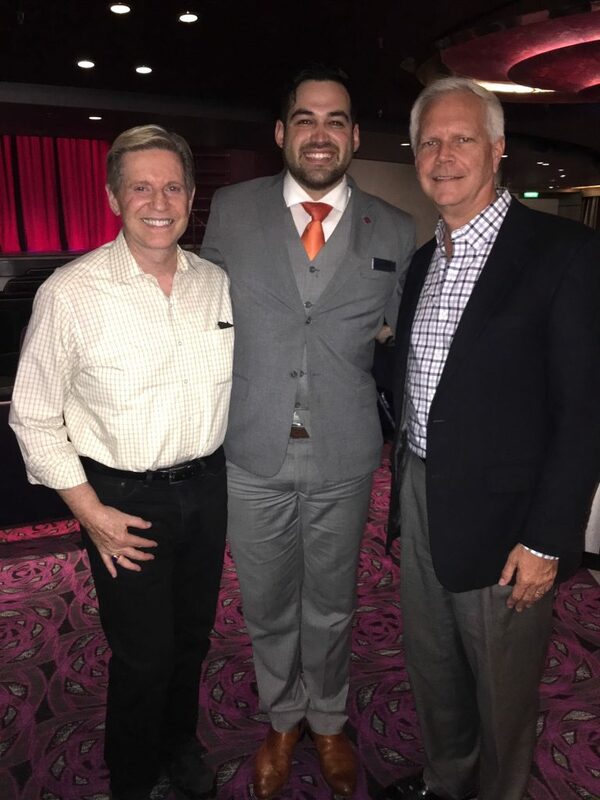 Typically, at the end of a cruise they attempt to show you much gratitude and appreciation prior to the guest survey where you rate your experiences during your cruise. It has been a good cruise but there are a few pet peeves and some room for improvement. In the afternoon the Indonesian crew put on a show on the main stage where they share with the guests a bit of their culture. They performed several folkloric dances, a musical number with instruments made out of bamboo and a couple of solo songs in their native language. It was a fun show and very well attended by the passengers. We began our packing trying to figure out how to get all this stuff in our cabin back into our suitcases. Along the way we received many gifts including several different styles and sizes of bags but the more bags we fill the more we have to deal with when we disembark. The evening’s entertainment was a show by the Amsterdam Singers and Dancers titled The Midnight Hour. The cabin stewards Pram and Saeff presented us with another unique bag for carrying things. The bag had a map of the Indonesian islands printed on it. Also printed were the names of our cabin stewards and all of the passenger’s names in the cabins they were responsible for maintaining. The weather on this sea day was very gray and cloudy and the temperatures are beginning to cool as we move eastward. The Morning Show with cruise director Jorge was our first event of the day where he interviewed the cast of the Alley Cats who performed last evening. The group has been around for 31 years and they have members scattered across the country from the New York area to the Los Angeles area. They perform in many schools, at festivals, at the San Diego Animal Park Christmas Show, local theaters and anywhere else that will have them. Next, Ian presented a few of his slides from previous cruises where he has traveled the world to show folks some interesting places they might want to consider on their next cruise. He will be onboard for the World Cruise beginning in January. 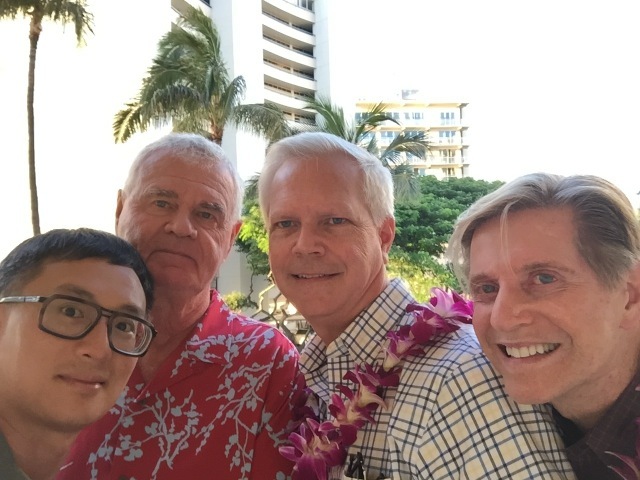 Kent attended a lecture by Dr. Joe Kess on the Pacific war. Mark attended a cooking class in America’s Test Kitchen where Spencer showed how to make Pad Thai and Scallion Pancakes at home. Interesting cooking class but not sure it is worth the work to make it at home when it is so easily available in the neighborhood. In the afternoon we attended a Mariner Society Cocktail Reception in the main showroom as a thank you to previous Holland America guests. In this case, most of the guests onboard are previous passengers. Drinks and appetizers were served by waiters dressed in sailors’ hats, shirts and white gloves. Platinum, gold, silver and bronze medallions were handed out to guests and photos were taken with the captain. For dinner we were invited to dinner with Captain Fred Eversen and his girlfriend Brooke Nantz in the Pinnacle Grill restaurant. Brooke works in the shore excursion office when the captain is onboard the ship. The dinner menu consisted of six courses plus a lime sorbet palette refresher. There was a salmon course, a tomato bisque course, a shrimp ravioli and black cod course, and a pork with butternut squash and cheese course. The main course was a steak saltimbocca which was very delicious followed by a dessert of chocolate and hazel nut tartella. All of this was accompanied with a Flanagan Beauty of Three Chardonnay from California and a Col Solare Meritage from Washington State. It was a wonderful dinner that we were happy to have been included in. The evening’s entertainment was a clarinet player by the name of Kenny Martyn. He played music as a tribute to the late Benny Goodman. When we returned to our cabin there were two gift boxes on our bed with Royal Goedewaagen plates in them. The plates have a map of the world and show all of the ports where we stopped along our voyage over the last 82 days. This is the beginning of our final leg home and people are beginning to feel sad that the voyage is almost over. This was the first of five sea days on our way back to Los Angeles. The sea has been calmer than it was on our arrival to Hawaii so people are happy with that. The ship was decorated for Christmas while we were in Hawaii so there are many trees, wreaths, gingerbread houses and garlands around the ship. Cruise Director Jorge interviewed Alex and Kirsten, the dance class instructors from Canada, at his Morning Show. They are always friendly, beautifully dressed and fun to chat with around the ship. Many of the guests came out to support them at the coffee chat this morning which was very nice. They will have a month off and will return to the ship in late January for the 2019 World Cruise. Kent attended another Behind the Scenes with the Amsterdam singers and dancers. Dr. Joe Kess gave a lecture on the Prelude to Pearl Harbor where he discussed what was going on in the Pacific region prior to the bombing of Pearl Harbor. It was all very complicated to follow the politics and parts that countries around the world played at the time. Not unlike the world today where world powers have political agendas that they might like to impose on the rest of the world. A delectable Sunday brunch sampler menu was served in the main dining room. This was once again a three-course meal with a sampling of about six cold starters followed by a sampling of six hot entrée items. All of this was followed by a dessert sampler of three desserts. Very delicious but not very helpful on the waistline. The afternoon included a guest talent show where guests performed all sorts of talents. There was the comedian, the singers, self-written poetry readings, the banjo and harmonica players, the magician and a comedy of dance. It was a wonderful display of the interests of a few guests onboard and an insight into their lives. 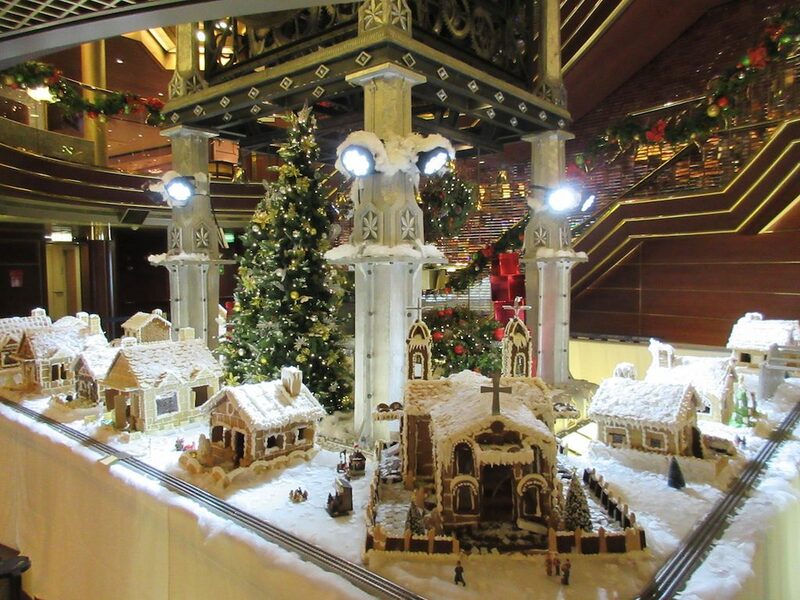 In the evening the ship had a Christmas tree lighting ceremony on three decks surrounding the central atrium. 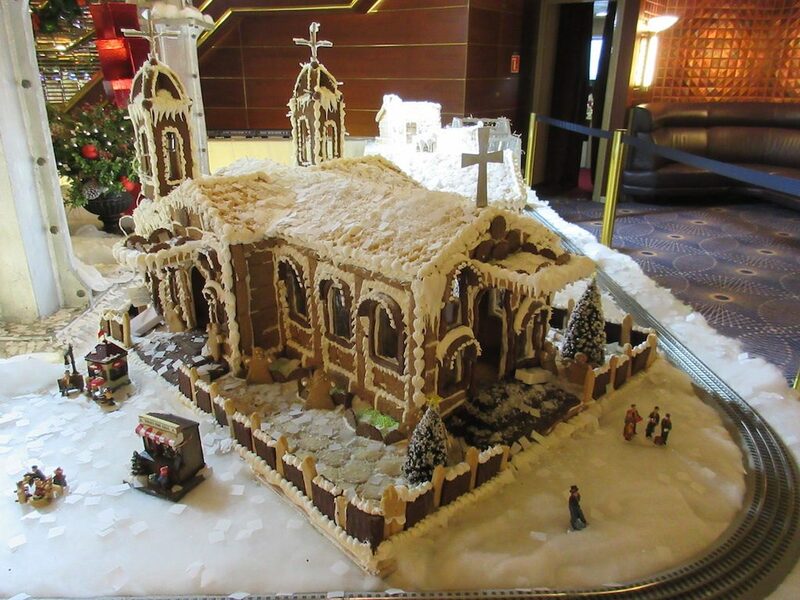 Deck three houses a Christmas tree which is surrounded by many gingerbread houses created by the kitchen staff and a toy train. They served drinks, hot chocolate and hot apple cider as everyone sang non-religious holiday songs. Madeline the eleven-year old girl onboard got the honor of lighting the tree and when she did paper snowflakes began to fall from several decks above. It was a festive occasion that everyone seemed to enjoy. We had dinner with a friend from Australia by the name of Martin who is traveling alone. It was his sister’s 60thbirthday (she is in Australia) and he asked the dining room staff to prepare a cake for her and to have the waiters sing to her. One of the waiters recorded it on his cell phone so that he could send her the video as a little birthday surprise. The evening’s entertainment was a group of four young men called the Alley Cats who performed acapella the music of the 50’s and 60’s. They harmonized beautifully and also had a variety of quirky silly jokes. They were dressed in Christmas suits of very bright colors including trees, plaids, snowflakes and the like. The audience liked them very much. Lahaina does not have a pier large enough for a cruise ship to dock so we had to anchor offshore and take tender boats into town. The weather was perfect in the 80’s with sunshine. 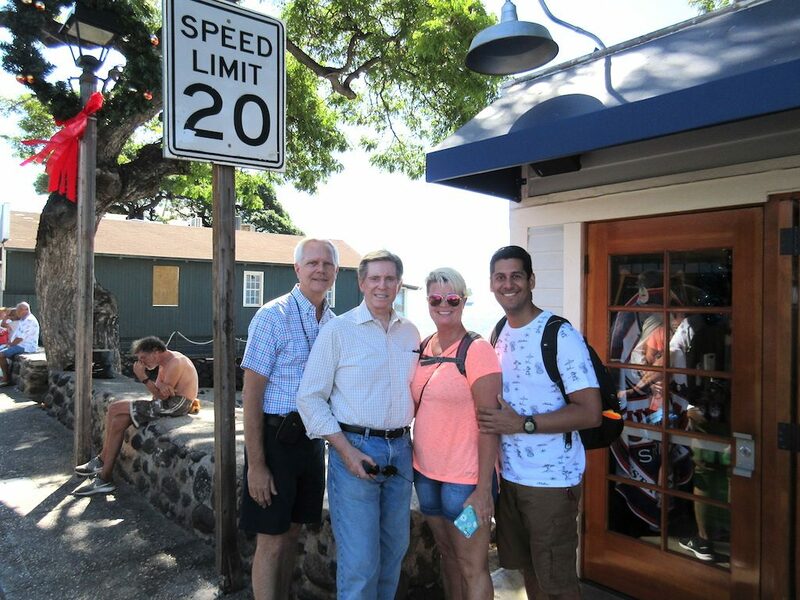 Lahaina was once known for its whaling industry, but today attracts sail boats and visitors from around the world. The center of Lahaina is known for its Banyan Tree Square where you will find an enormous banyan tree that was planted in 1873. 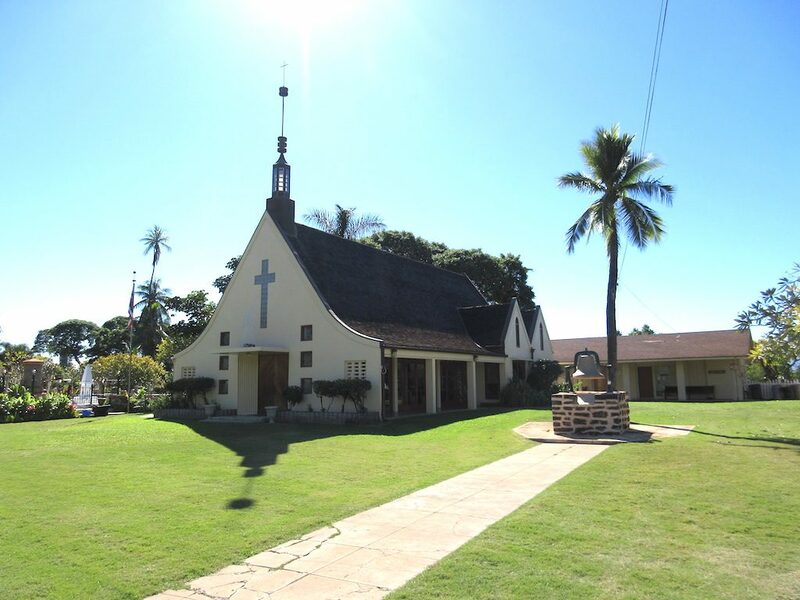 The tree was planted to commemorate the 50thanniversary of the arrival of Christian missionaries. The city center is filled with an eclectic mix of shops, galleries and restaurants. We headed out on foot to explore the many shops and galleries as well as a few spots off the main streets where we saw a glimpse of local life. 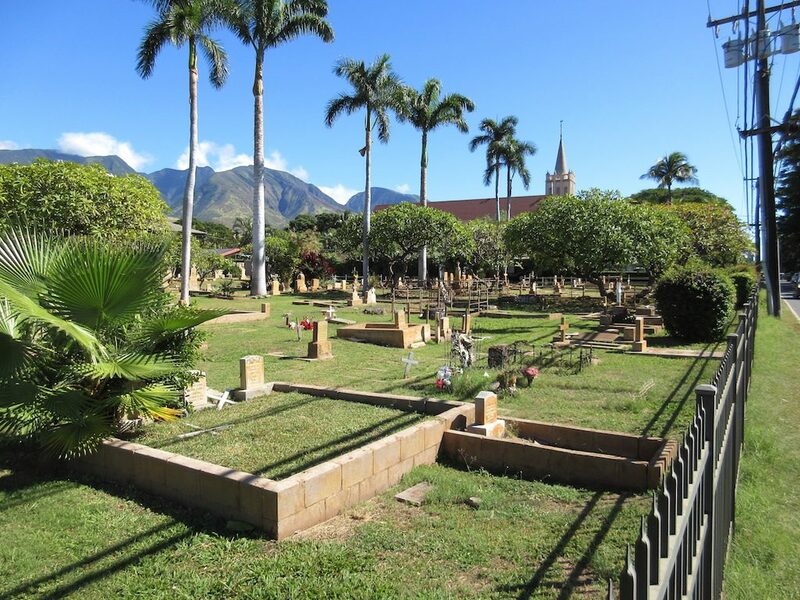 We visited the Seaman’s cemetery, the Maria Lanakila Catholic Church, the Holy Innocents Episcopal Church, the historic jail dating back to the whaling days called Hale Pa’ahao, the Lahaina Hongwanji Mission, the Waiola Cemetery, the Waiola Church and more. Upon return, Kent rested his knee and slept for two hours. For dinner the ship had a Luau style meal served in the Lido Market. They served roasted pigs, beef ribs, corn on the cob, a local wahoo fish and a variety of other local dishes. The dining room was decorated with green fern leaf printed table cloths, paper leis at each place setting, tiki lights on each table and grass skirting around all of the buffet stations. The evening’s entertainer was Frank King who is a comedian and conversationalist. His voice was nearly gone from a show on land where the sound system was not working well and he had to project. It was unfortunate that we have had so many comedians onboard that people are not very impressed with another comedian unless he is outstanding. He attempted to have a conversation with a couple of folks in the audience but it did not go over very well. Many people in the back of the theater left and there was little applause when he was finished. Honolulu is the capital and largest city of the U.S. State of Hawaii. It is the most remote city of its size in the world with a population of approximately 350,000 in the city and about 1.5 million in Hawaii. 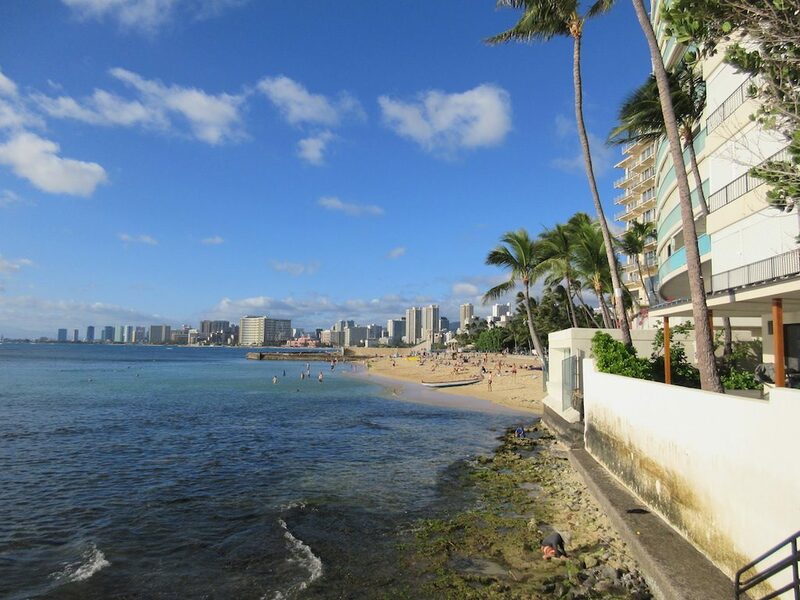 The word Honolulu means “Sheltered Harbor” or “Calm Port.” In 2015 the city was ranked as one of the most livable cities and the second safest city in the U.S. The city has been the capital of the Hawaiian Islands since 1845 and gained historical recognition following the attack on Pearl Harbor by Japan on December 7, 1941. Honolulu is believed to have been settled as early as the 11th century. In 1794 Captain William Brown of Great Britain is believed to have been the first foreigner to sail into what is now Honolulu Harbor. Soon, more foreign ships followed making the port of Honolulu a focal point for merchant ships traveling between North America and Asia. In 1845, King Kamehameha III moved the permanent capital of the Hawaiian Kingdom from Lahaina to Honolulu. 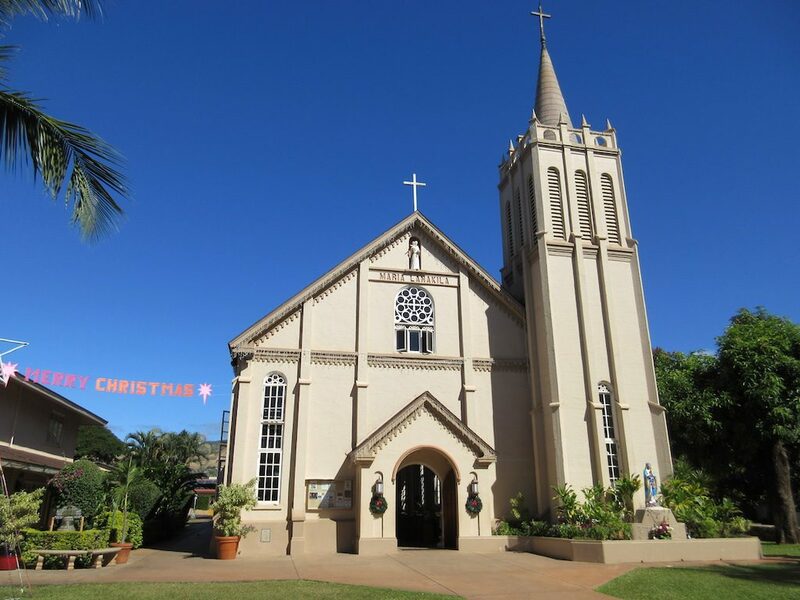 He and the kings who followed him transformed the city into a modern capital including a St. Andrew’s Cathedral and the Iolani Palace. At this same time descendants of American missionaries were establishing major businesses in downtown Honolulu. There were turbulent times in the late 19th and early 20th century. Disease was brought by the Europeans, the Hawaiian Monarchy in 1893 was overthrown, the annexation by the United States in 1898, a large fire in 1900 and the Japanese attack on Pearl Harbor in 1941. Despite all of this, the city of Honolulu remained the capital, largest city and the main airport and seaport of the Hawaiian Islands. Following statehood in 1959 there was an economic and tourism boom bringing rapid economic growth to Honolulu and Hawaii. Today, tourism is the largest industry with nearly ten million people visiting the islands each year and growing. When we disembarked the ship, we were presented with beautiful purple and white dendrobium orchid leis. Our day started with our Realtor friend Karen, who lives on the big island, picking us up at the port and taking us on a scenic tour of part of the island. We visited some of the neighborhoods where she grew up after moving here from Kansas with her family. 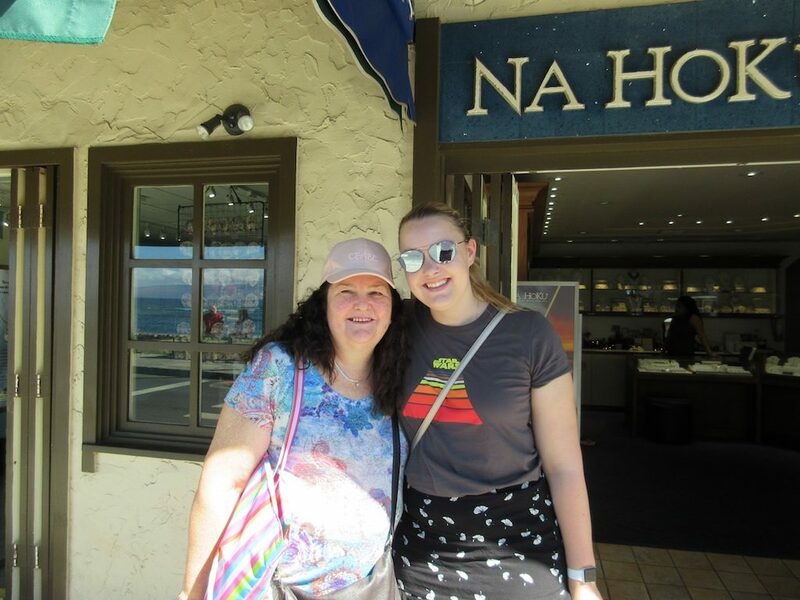 We saw some gorgeous beaches, scenic outlooks, some very expensive neighborhoods and stopped for coffee to catch up. We met Karen when we were in Porto and Madeira, Portugal, in June and shared many laughs, meals and good times. After our visit with Karen, she dropped us at the Ala Moana shopping center where we met up with our friends Bob and Eugene from Vancouver and local friends of theirs, Fred and Tom, for lunch at Mariposa. All of them had cruised through San Diego several years ago and we were able to visit with them all then. Bob and Eugene have had a condo here at the end of Waikiki Beach for about ten years and Bob spends the winter here while Eugene visits several times as he is still working. After lunch we went back to Bob and Eugene’s condo to continue our visit. Eugene entertained us while Bob attended his Sony Open meeting. 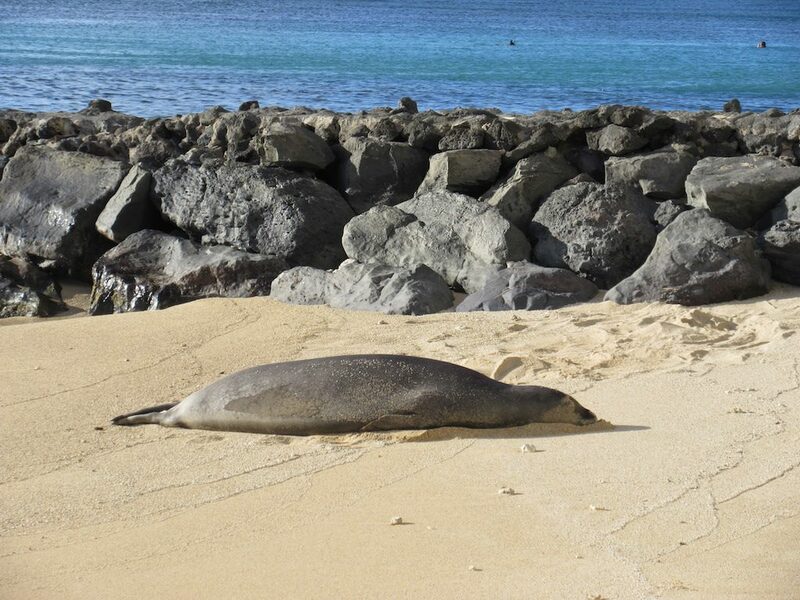 On the beach in front of their building was a lone sea lion who had taken up residence and was resting comfortably on the sand. As the animals are protected, they had placed construction cones and signs telling people to stay away from the wildlife and not to disturb the sea lion. Upon Bob’s return, we all enjoyed a Costco run, where we bought some Hawaiian candy and cookie gifts for friends before returning to our ship. All in all, we had a great day visiting with friends and catching up and hope to see them all again soon. The weather was delightful with warm temperatures, a constant breeze and only a minor shower. The evening’s entertainment was a local show called Drums of Polynesia. The show featured a singer, four female and one male dancer who performed a variety of Polynesian songs and dances. The rough seas continued with the ship rolling from side to side, often interrupted by a violent shaking where things fall off the shelves and everything rattles. We attended Jorge’s Morning Show with harp player and vocalist from Australia Alana Conway. 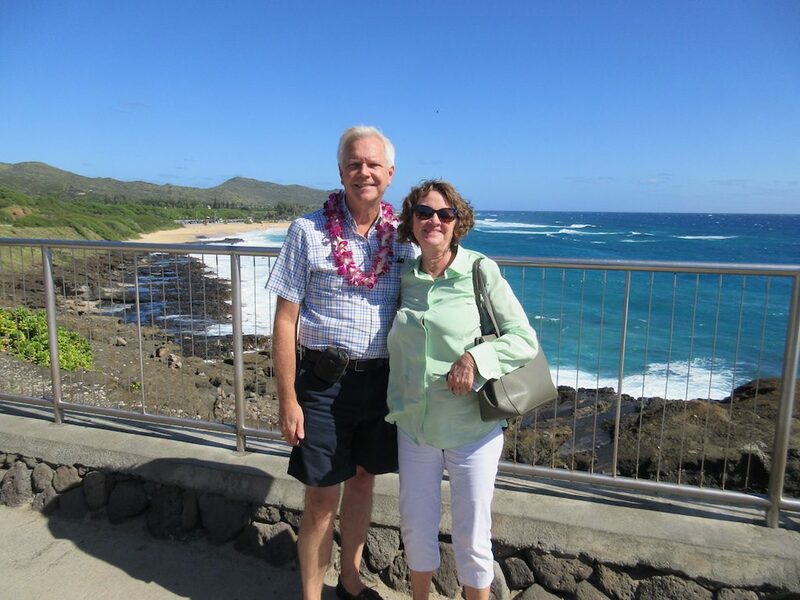 Next, Ian gave a talk on things to see and do in our two ports in Hawaii. Kent attended a lecture by Professor David Horne on Pearl Harbor while Mark attended a cooking class in America’s Test Kitchen with Spencer. Spencer showed folks how to make a chicken marsala, a rice pilaf and a chocolate cake. The marsala smelled wonderful and didn’t look too difficult to prepare. In the afternoon Hawaiian Cultural Ambassador Kainoa gave a lecture on the formation of Hawaii as a territory and later the 50th State of the U.S. Kainoa was very adamant that he was a Polynesian and not an American as he does not live in America but in the Pacific Ocean far from America. He said that young people in Hawaii are carrying on the culture and learning the Hawaiian language. Kent enjoyed Afternoon Tea with Jeffrey and Madeline while Mark worked on a community puzzle. The puzzle Nazi was not at the puzzle table this afternoon so it was safe to work on the puzzle. Cruise Specialists host Tom Mullen hosted us at a Hawaiian themed cocktail party in the Explorers Lounge. We had passed hot appetizers and limitless drinks. The evening’s entertainment was a show by the Amsterdam singers and dancers titled On Tour. Afterward we took photos with Jorge, Alex and Kristen (the passenger dance instructors from Canada) and headed off to our cabin! The weather through the night was very bumpy from the large swells in the ocean making for difficult sleeping. The skies were filled with clouds and the winds were blowing. White caps could be seen everywhere. Jorge hosted his Morning Show with coffee and muffins and he interviewed the comedian, pianist and song writer, Robbie Howard, who had performed several nights earlier. His show was the one that included impersonations of many Las Vegas performers from years gone by. We attended a Future Cruise Presentation to see if there were any new things we should be aware of when it comes to cruising. Not much new or informative and no particular itinerary that looked appealing to us at the moment. Hawaiian Cultural Ambassador Kainoa gave a talk on The Polynesian Migration. He discussed how the Hawaiians sailed to this most isolated island group in the world. He talked about what great sea navigators they were and still are today. Some folks believe that the Hawaiians came from southeast Asia while others believe they may have come from South America. Links have been found in both areas making people think they did sail the entire Pacific Ocean. The afternoon included a lecture by Dr. Joe Kess about 1,000 Words of the Hawaiian Language that we Already Know. This talk discussed how many words are shared from one language to the next. Sometimes the words were translated by sound rather than the written language. Some languages, like Hawaiian, do not allow two consonants together and a word can only end in a vowel so words are often altered to fit the rules of a particular language. Kainoa hosted a performance by fellow guests who put on a hula and ukulele show after a week of classes by the Hawaiian Ambassadors. There was a large group of participants and both the hula dancers and the ukulele players performed two songs. It was a very short and sweet performance. 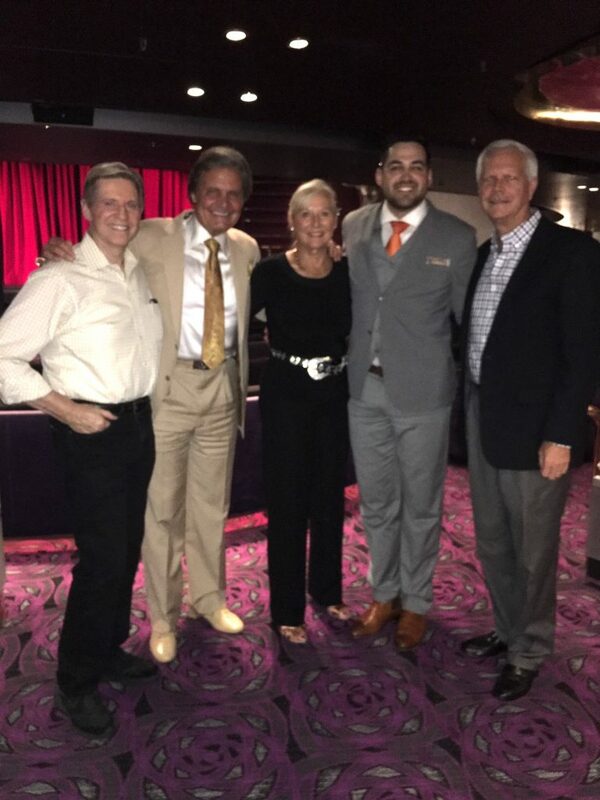 The evening’s entertainment was a second show by Robbie Howard the Las Vegas impersonator and comedian. He performed a whole new set of songs. This sea day we attended cruise director Jorge’s Coffee Chat where he interviewed Entertainment Coordinator Bienelisa. Bienelisa is from Orange County, California, although her parents are from the Philippines. She is responsible for the daily bulletins called the When and Where and coordinates various activities. Hawaiian Ambassador Kainoa presented a lecture on the Geology and Geography of Hawaii. Here he discussed how the islands were created from volcanoes and how the islands deal with these natural wonders. He also touched on the issue of tsunami’s created from earthquakes and how one of these may devastate the islands in the future. 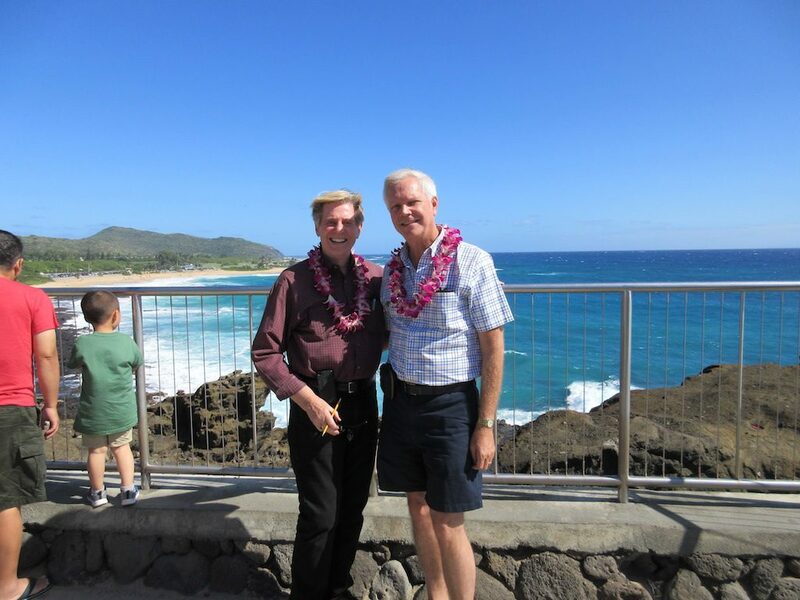 Professor David Horne presented a talk on Hawaii-From Polynesian Monarchy to the 50thState. He discussed the monarchy of Hawaii, the British control of the island, the U.S. Territory and then the eventual statehood of the islands. The afternoon included a talk by Hawaiian Ambassador Kainoa on the Hawaiian Lei. He showed photos of the many varieties and styles of leis in Hawaii. They are used to celebrate holidays, births, deaths, graduation, or just to be worn to church. They are worn by men, women and children every day and are just another part of daily life on the islands. The evening’s entertainment was a show titled “On Tour” by the Amsterdam singers and dancers. However, due to the very rough seas the show was postponed. Instead of the show they showed the movie White Christmas with Bing Crosby. When we arrived back at our cabin we found a small gift of two leather luggage tags and two luggage straps with a combination lock each. On this sea day we crossed the equator and received a certificate from King Neptune for doing so. We crossed the equator and thus another reason to celebrate. King Neptune, or Poseidon in Greek mythology, is believed to oversee the equator. In order to secure safe passage for the ship over the equator, we had a special ceremony. Making an appearance was the cruise director, Jorge, as King Neptune and one of the Amsterdam singers, Claire, as a mermaid. They officiated a ceremony where crewmembers from different departments were brought before a panel of the captain and his officers for judgment for a variety of fictional crimes. 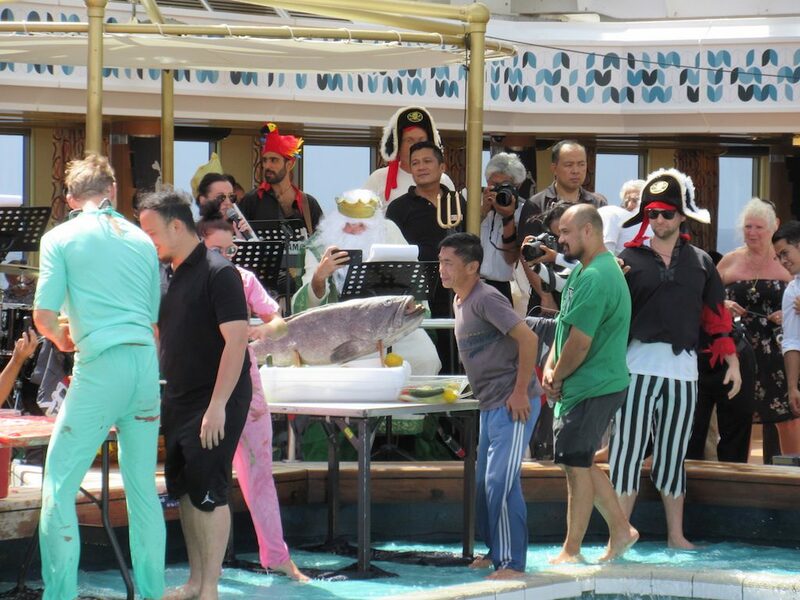 Each set of crewmembers was then required to kiss a large fish before being covered in pink, green or blue slime and thrown in the swimming pool. The Amsterdam orchestra and some of the staff were dressed as pirates and everyone had a fun time. The afternoon included a lecture by Professor David Horner who shared data on World Migration Over the Centuries. He showed slides and graphs revealing how, over the history of the world, there have been mass migrations of one sort or another. Sometimes people are fleeing religious persecution, famine, heat, lack of work or for other reasons. Sometimes they are just looking for a better life in another part of the world. Next, Joe Kess lectured on Easter Island—even though we are not visiting the island on this voyage it is out here in the middle of the Pacific Ocean. He discussed the early days on the isolated island when they had no interaction with the rest of the world up to current times. Easter Island is a part of Chile and keeps the same time as Chile. Easter Island is located 2,237 miles west of Chile and 1,290 miles east of Pitcairn Island, making it one of the most isolated, inhabited places in the world. The island is almost triangular in shape and is approximately 17 miles in length and 8 miles in width at its widest point. It was given the name Easter Island because the Dutch discovered it on Easter Sunday in 1722. Literature suggests that Easter Island was settled around 300-400AD about the time that Hawaii was settled; however, some scientists say the island was not inhabited until 700-800AD. The evening’s entertainment was a singer, pianist, comedian by the name of Dale Gonyea. He was very entertaining with his unique storytelling and song writing about our recent ports of call.